Christmas should be the most wonderful time of the year, but sometimes it can be the most stressful time of the year! 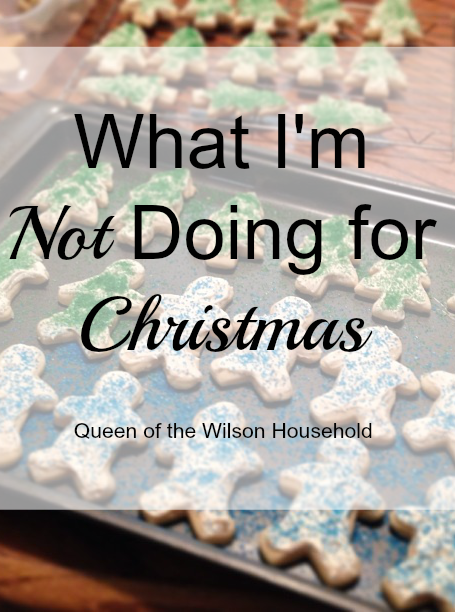 Last week I shared 6 lists to make for Christmas preparation, and I also shared that I make a “not-doing”list. It is something that I started the year I was pregnant and just getting over morning sickness. That was the start of me simplifying my life. There may be things on my list that you want to do for Christmas because it brings you joy. I say, do it! Everyone’s Christmas traditions will be different. But you can probably think of some other things that you could skip this year. Give yourself a little grace and avoid the added stress. So here’s what I’m NOT doing this Christmas. 1. I’m not getting professional photos. I plan to take pictures of my son in front of our Christmas tree. Last year, I used a picture I took for our Christmas cards and plan to do the same this year. I’m just not willing to pay hundreds of dollars for a picture that I can take myself. 2. I’m not making a lot of Christmas candy and goodies. I stick to 3 items: my husband’s candy request, my favorite Christmas candy, and frosted sugar cookies. There is usually plenty to give away to family and neighbors as well. 3. I’m not getting a real Christmas tree. Our faux tree is pretty, and I actually prefer it because it is so easy to put together. Of course, it saves us some money too! 4. I’m not going Black Friday shopping. A) I’m not a crowd person. 5. I’m not writing a Christmas letter. Last year was the first time that I wrote a Christmas letter. We had a lot of changes in 2014: a baby, new house, and I became a SAHM, so I wanted to share that in the letter. However, this year I don’t want to spend the time on a letter, so I’m just sending out photo cards that I will make through Wal-Mart’s Photo Center. 6. I’m not decorating the entire house. The Christmas that I was pregnant, I only decorated the living room instead of the entire house. I loved the simplicity of my decor, and plan to only decorate the main living areas again this year. 7. I’m not comparing myself to others. It can be easy to compare ourselves to others at Christmas time. Someone else may have a perfectly decorated tree, huge piles of gifts under their trees, or elaborate parties, and you may think that you don’t measure up. But you can only compare yourself to yourself. Do the best you can with what you have, and enjoy the season spent with family and friends! What are you NOT doing this Christmas? So true, Laura! We put a lot of pressure on ourselves when we compare ourselves to others. I have to intentionally focus on the special time with family and the Lord during the craziness of the season. I love this! I'll tell you what I AM doing this Christmas. Focusing my time and energy on being together! Helene, that sounds like the best way to celebrate Christmas! Our time spent with loved ones is priceless. I already don't do so many of these things! They just aren't worth the stress! Great list. I'm also going to simplify this year. I have accumulated all these decorations over the years and for the longest time I would just put the ALL up… It was starting to look like a circus. So this year I'm going to be very selective and have a decorating theme (gasp) !! I can relate, Mary. The last few years I have been donated Christmas decor that I didn't want anymore and not buying anything to replace those items. It is amazing how much more I like my Christmas decor with less stuff. Yes! My thoughts exactly. It would not be Merry if we run ourselves to death! Thank you, Vickie! I hope you had a great Thanksgiving as well! AWESOME! I'm not going Black Friday shopping, although perhaps online, much more convenient! Christmas is about the time spent together, not all the stuff, way to go! Online shopping is the best! And you still may be able to find just as good of deals as the stores. Oh we hvae this fake little one, and it's not that I don't want the real deal, we just don't have a place to put it without Sophie getting into it. we started the photo card tradition too! So much easier than writing a letter, but it is tough to wrangle Sophie into being ready for the photo. The toddler years are crazy, aren't they?! The bottom half of our tree doesn't have any ornaments because of Caleb. 🙂 I hope you are able to get a good picture! I love your list, especially number 7. Comparison is a joy stealer. You are very wise to stay away from it. I too, will only decorate my living room. It just keeps things simpler and I'm all about that! Thanks so much for posting this list. It's really got me thinking. Yes, I wish I had learned not to compare to others a long time ago. It would have saved me a lot of heartache. 🙂 Only decorating the living room also makes taking it down and putting it all away a lot easier too!